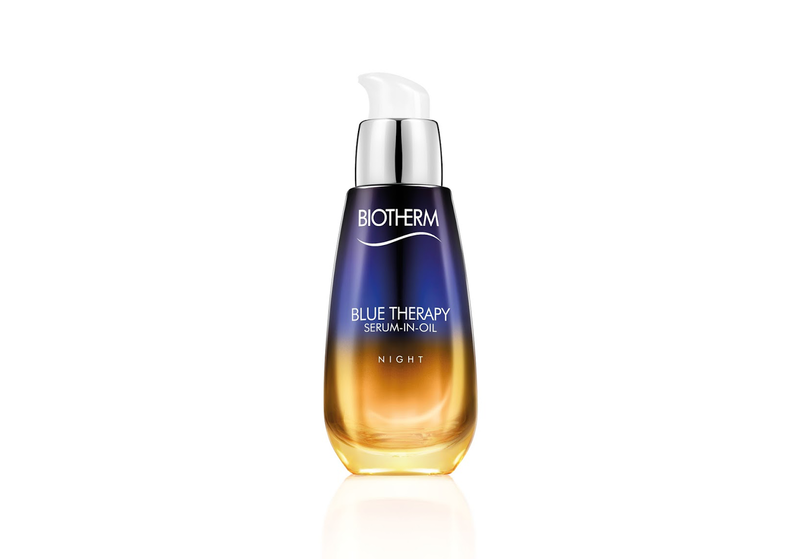 At the moment I am obsessed with the skin serum in oil - Blue Therapy from Biotherm. It is one of the best serums that I have ever had the privilege to try. It should be used for night and it leaves the skin smooth and nourished for 24 hours. I tested it on my extremely dry skin. The first wrinkle between the eyebrows disappeared too. What I did not want to believe about a month ago, but it happened. Serum has blue-yellow elegant packaging with practical applicator. It is enough to press it three times just to cover all the skin. In first seconds the serum appears like gel, but after the application on the skin is immediately changed to oil which contains omega 3 fatty acids. You'll get it in any better drugstore in one available size - 30 ml for very affordable price, cca usd 90. Momentálne si ulietavam na pleťovom sére, ktoré je novinkou - Blue Therapy od Biotherm. Je to jedno z najlepších sér, ktoré som kedy mala tú česť vyskúšať. Používa sa na noc a pleť zanecháva hladkú a vyživenú po celých 24 hodín. Moja extrémne suchá pleť to má odskúšané a keby mohla, tak sa mi poďakuje. Prvá vráska medzi obočím zmizla tiež. Čomu som asi pred mesiacom nechcela síce veriť, ale stalo sa. Sérum má elegantné modrožlté balenie s praktickou pumpičkou. Trojnásobné stlačenie stačí na pokrytie celej pleti. V prvých sekundách sa sérum javí ako gelové, ale na pleti sa okamžite mení na olejíček, ktorý obsahuje omega 3 mastné kyseliny. Zoženiete ho v každej lepšej drogérii v jednej dostupnej veľkosti a to 30 ml, za veľmi prijateľnú cenu, cca usd 90. Thank you for this fantastic review. This product must be really nice,I allready love the brand,I ve tested Biotherm in other products and like it. thank you for sharing,the packaging is so cute! I love Biotherm products! Haven't tried this serum, but it sounds like a great product! The packaging is so elegant and the price is reasonable as well. This sounds perfect for me. Have used Biotherm skincare before and really loved the produxts. Sounds like a really great product!